Sales Results – Three strikes you’re out! 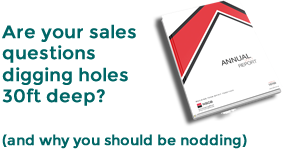 Managing sales teams can be challenging on a number of levels, but perhaps the most challenging is maintaining a focus on sales results without becoming paranoid about them or constantly banging on about ‘Results, Results, Results’. The most effective sales teams and sales managers focus on driving the right activities, behaviours, attitudes skills and knowledge, and rightly so! However, at the end of the day (or the month!) there must be a consequence for salespeople that consistently fail to reach their targets. This can’t be a short term view. As we all know things can happen that can make one month sensational and the next terrible. But continued failure to meet targets, failure to perform, must come with a consequence. Your salespeople have to understand that there will be a consequence for regular poor sales performance. First strike: If a salesperson fails to meet 80% of his or her sales target for 3 consecutive months they receive a formal written warning. Second Strike: If they fail to meet 80% in the subsequent month they receive a second formal warning. Third strike: Failure in the next month, i.e. the fifth consecutive month, will lead to dismissal. The situation where a salesperson fails to meet target for 2 months, then meets target for 1 month only, then fails for the next 2 months and so on. In this case, the Sales Manager would have the discretion to give a warning even though it was outside the actual policy. Whatever system your business comes up with it should be designed to drive the right behaviours, and we can’t think of any instance where the right behaviours don’t include salespeople meeting their targets. Yes, your sales managers need to develop, coach, mentor and give your salespeople feedback, but your salespeople need to know that achieving their targets is mandatory, not optional. It’s what they get paid for. In the same way your sales managers are responsible for team targets and should be held accountable for them.